This is me: Annette. I’m a bookish girl. How could I possibly not end up in the book arts? This image was taken at a colleague’s workshop, at Heinrich Buser’s Greno Printing Office. I was assisting with printing at his Heidelberg windmill which was, I admit, a very special experience. I myself don’t own such a magical machine. My presses are all manually operated, and that is perfectly fine with me. I got serious with printing in 1998 – that was when I bought my first proofing press, a KORREX Hannover. 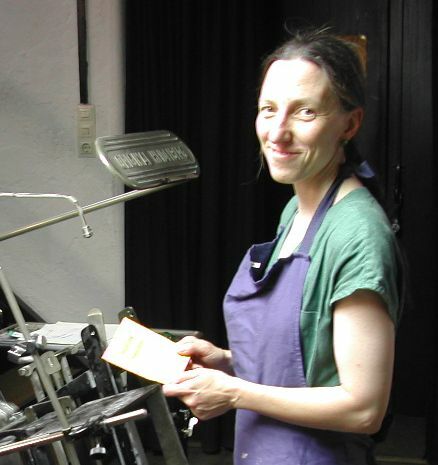 I am into wood- and linocut, letterpress printing using metal and wood type, and I’m into bookbinding. 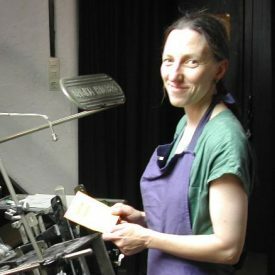 I’m a member of The Fine Press Book Association, the Oxford Guild of Printers and the BK (Bundesverband Kunsthandwerk).